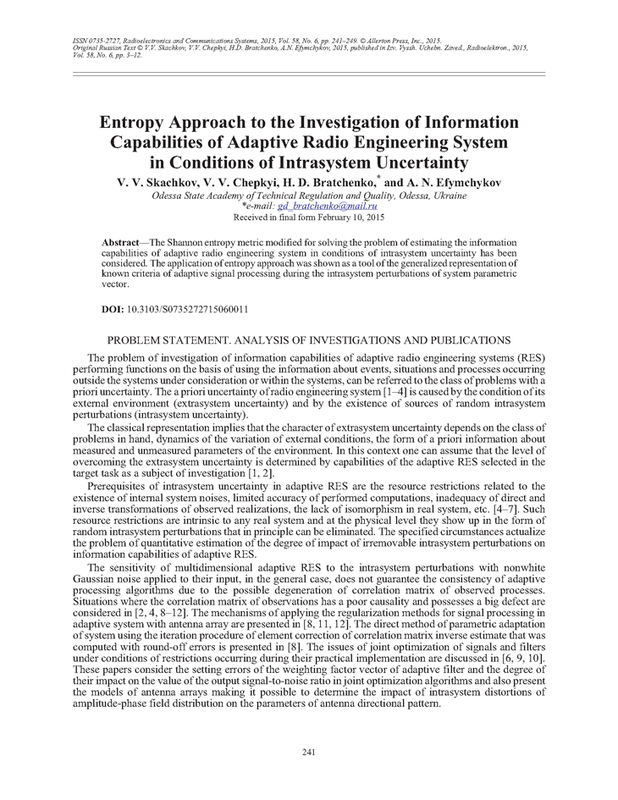 The Shannon entropy metric modified for solving the problem of estimating the information capabilities of adaptive radio engineering system in conditions of intrasystem uncertainty has been considered. The application of entropy approach was shown as a tool of the generalized representation of known criteria of adaptive signal processing during the intrasystem perturbations of system parametric vector. REPIN, V.G. ; TARTAKOVSKII, G.P. Statistical Synthesis in Conditions of a Priori Uncertainty and Adaptation of Information Systems. Moscow: Sov. Radio, 1977 [in Russian]. MONZINGO R.A.; MILLER, T.W. Introduction to Adaptive Arrays. New York: Wiley, 1980. VAN GIGCH, J.P. Applied General Systems Theory. New York: Harper & Row, 1978. COWAN C.F.N. ; GRANT, P.M. (eds. ), Adaptive Filters. Englewood Cliffs: Prentice Hall, 1985. SKACHKOV, V.V. The effect of intrasystem interferences on the efficiency of adaptive signal processing with quadratic criterial function. Izv. Vyssh. Uchebn. Zaved., Radioelektron., 1997, v.40, n.10, p.34-40 [Radioelectron. Commun. Syst., 1997, v.40, n.10, p.30-35]. KOSHEVOI, V.M. Joint Optimization of Signals and Filters with Additional Restrictions: Textbook. Kiev: Uchebno-metod. kabinet po vysshemu obrazovaniyu, 1990 [in Russian]. GLUSHAKOV, V.I. ; KOBIN, S.V. Accuracy of microprocessor realization of algorithms for time-spatial processing of radio signals. Izv. Vyssh. Uchebn. 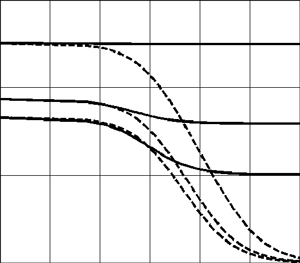 Zaved., Radioelektron., 1985, v.28, n.4, p.60-62 [Radioelectron. Commun. Syst., 1985, v.28, n.4, p.52-54]. GRESHILOV, A.A. Incorrect Problems of Digital Processing of Data and Signals. Moscow: Radio i Svyaz’, 1984 [in Russian]. GORBAN, I.I. Phenomenon of Statistical Stability. Kyiv: Naukova Dumka, 2014 [in Russian]. LEONOV, A.S. Generalization of the maximum entropy method for solving incorrect problems. Sibirskii Matematicheskii Zhurnal, July-August 2000, v.41, n.4, p.863-872. LEKHOVYTSKIY, D.I. ; ABRAMOVICH, Y.I. ; RYABUKHA, V.P. ; ZHUGA, G.A. ; RACHKOV, D.S. ; SEMENIAKA, A.V. Band-diagonal regularization of ML-estimates of correlation matrices in problems of signal adaptive processing against the background of Gaussian interferences. Prikladnaya Radioelektronika, 2011, v.10, n.4, p.419-421. CHEREMISIN, O.P. The efficiency of adaptive algorithm with regularization of sample correlation matrix. Radiotekh. Elektron., 1982, v.27, n.10, p.1933-1942. VAN TREES, H.L. Detection, Estimation and Modulation Theory, v.1, 2nd ed. Wiley, 2013. DEMMEL, J.W. Applied Numerical Linear Algebra. SIAM, 1997.